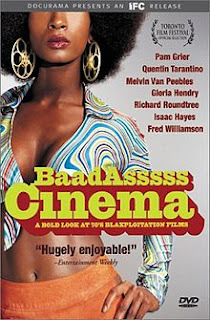 Produced for the Independent Film Channel in 2002, Baadasssss Cinema is an hour-long documentary that provides an overview of Blaxploitation films of the 1970s, from the origins of the genre to its eventual decline in popularity. For Baadasssss Cinema, director Isaac Julien and his crew interview a number of personalities, from the men and women who helped define Blaxploitation (Melvin van Peebles, Fred Williamson, Pam Grier) to those the genre influenced, including Quentin Tarantino (a regular in these sort of documentaries), Samuel L. Jackson, and Afeni Shakur, mother of Tupac Shakur (according to Ms. Shakur, her son was a big fan of these movies, and, by the time of his death, had amassed a large collection of them). Most interesting of all, however, are the sequences where Baadasssss Cinema delves into the history behind these films, how black audiences weren’t given a voice in the movies coming out of Hollywood at that time, which inspired a few filmmakers to take the initiative and produce their own pictures centering on the “black experience”. The first to do so was Melvin van Peebles, whose Sweet Sweetback’s Baadasssss Song is credited as being the film that launched the Blaxploitation movement. A colorful character, van Peebles tells us about an experience he had watching his movie with a live audience, and this story alone makes the entire documentary worthwhile. (for more on Sweet Sweetback’s Baadasssss Song and Melvin van Peebles, check out his son Mario’s 2002 film, Baadasssss, a dramatized account of the making of that movie). But Baadasssss Cinema offers plenty more besides, featuring clips from such movies as Shaft, Coffy, Blacula, and a variety of others, as well as commentary from critics (like Elvis Mitchell and Armond White) and film scholars, all discussing the tremendous effect these films had on ‘70s pop culture. At only an hour long, Baadasssss Cinema couldn’t possibly cover every single aspect of this fascinating genre, yet what it does do is whet your appetite just enough to make you want to learn a whole lot more.